I noticed the other day when I pulled my 06' M35X out of the garage the cooling fans were running which I thought odd but blew it off. Same thing today; start car up and the cooling fans are running. Pulled the car in the garage today after being out and the fans were running. Sat in car for over 5 minutes assuming the fans would cycle off once temperature drop. The fans keep running. The temp gauge isn't even near the half way point. Any thoughts?? Last edited by EdBwoy on Sat Feb 03, 2018 11:05 am, edited 1 time in total. Maybe fan relay is on the fritz? Not quite sure as I've never experienced this on any car I've had. The swap itself was easy. Only 3 bolts (10mm I believe) that hold the module to the radiator and two connectors. took maybe 15 mins to replace. But you will have 2 connectors plugged in. they might give you a little hard time to remove. Apply some pressure and those connectors will come off. Midnight thanks. The pic helps. I assume that once I take the plastic top radiator cover off that's bolted on the module will be exposed. Its bolts that fasten the module to the bracket; not screws correct. Yes. I believe thats an air duct for the stock MAF. But yes, once you remove that you'll see it bolted to the cooling fans. I believe they were 3 x 10mm bolts. Tkx midnight; appreciate your help. Hey Midnight I found the module. pretty much in the open. You said you were able to release the connectors from the module applying pressure. It looks like there are release buttons/tabs on the connectors? YES? Replacement module will be delivered tomorrow. Just turned 87,000 on the clock today. Midnight is right on...I had the same issue with fans running continuously. Ordered the replacement fan control module...Removed that portion of the air intake above the radiator...Remove the 2 bolts...Remove the 3 wire harnesses...Reinstall the same way. One of the more straightforward repairs I have had. Refer to Infiniti Net to confirm campaign eligibility. On some 2006 M35/45 vehicles, the radiator fan motor may begin to operate incorrectly or not operate at all. If this occurs, in certain limited circumstances, the engine control logic may temporarily reduce engine output in order to protect against overheating damage. To prevent this potential condition, Infiniti is conducting this Voluntary Service Campaign to replace the radiator fan control module free of charge for parts and labor. I went online to the Infiniti recall site and put in my VIN number to see if it cited a recall. Nothing. So are you saying this is a dealer initiated recall Campaign? So I guess I would have to call the Infiniti dealer and see if their will to comp me for the replacement. In any case, the module will arrive today. My fan doing the same thing, thanks for the info guys. (2) 10 mm bolts that secure the module. and air duct unit. Started M and let it run. Problem solved. That's it. @gavnator/@midnight Good questions, and I am not surprised that you could not find your VIN listed in the Infiniti recall search database...The reason is likely because the radiator fan module fix is a "Voluntary Service Campaign" which differs from a more formal recall (e.g. Takata airbags). Your best bet is to call a good/local/trusted Infiniti Service Center and have them do the VIN look up in their system...Of course, I did not heed my own advice...Since the module was less than $100, I figured it was easier to just replace it than to mess around with appointments, etc, but might be worth it if they will reimburse you the cost of the module. Hey gavnator in the pic is the I purchased off a local M35 and the right is my current one. Do you have a pic of yours? Airman I don't have a picture but if you go up in the post you'll find midnights post with the part I bout on Amazon which is correct. I paid $42.00 for the part. 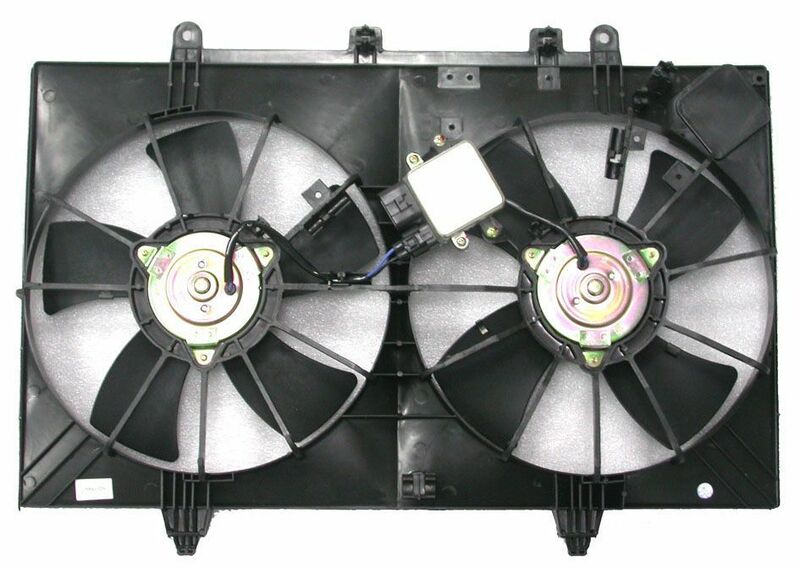 The part is BECKARNLEY 203-0276 Cooling Fan Control Module. Look at Midnights posts above and follow my info. Piece of cake. Looks like I'm next to implement this fix. I've ignored the sound for a while but it's finally getting on my nerves. @mercman - good luck! It's a relief that fan turns on/off when its supposed to. I have this issue as well on a 2010. If the dealer will honor, seems easier to just bring in. You get a loaner when drop it off, and get on your way. Caveat, the voluntary recall (TSB) does not include my model year. Good time to see if they also can address my cruise TSB. Long shot to get a TSB covered in a 2010, but will give them a call. Glad to know that I can do this easily. Ups to EdBwoy for the vid. Mine has started to come on and stay on, the noise is annoying to say the least, Rock auto has the Beck/Arnley relay for about 36 before shipping, gonna just buy that and be on my way!